Nokia’s Lumia 625 bares little resemblance to the Lumia 620 it replaces thanks to packing a much bigger screen - the largest display in fact of any device in the Lumia range. At 4.7" the IPS LCD capacitive touchscreen of the R3 500 Lumia 625 is a lot bigger than the 3.8" display of the Lumia 620. We really enjoyed using the added screen real estate to watch movies, and another benefit of the larger display being less scrolling, panning and zooming on webpages. However, this screen is without a doubt not the sharpest screen you get on a Lumia smartphone since it sports a resolution of just 480 x 800 pixels, culminating in a below-par pixel density below 200 ppi. This touchscreen is equipped with Nokia’s super sensitive technology, which means you can use it while wearing gloves. Unfortunately it lacks the Finnish firm’s ClearBlack technology, resulting in lots of glare and reflection when the phone is used outdoors. The Lumia 625 is not the thinnest (9.2 mm) nor the lightest (159 g) smartphone on the Lumia block, but in spite of this it never feels bulky in hand and can easily slip into your jeans pocket. This smartphone boast a colourful polycarbonate shell that you remove (not the simplest task in the world) to gain access to the microSIM and microSD memory card slots on the left of the device. 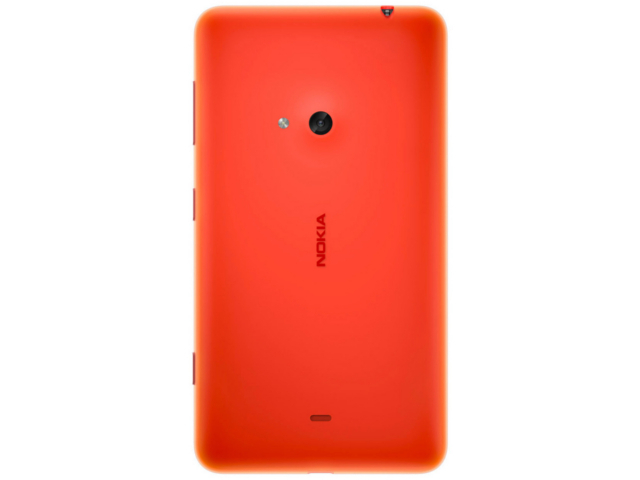 Powering the Lumia 625 is a Qualcomm MSM8930 Snapdragon chipset that consists of a dual-core processor running at 1.2 GHz per core and an Adreno 305 GPU, which is partnered with 512 MB of RAM. This combination does enable smooth and snappy performance whilst navigating the platform and during general usage, but noticeable lag does occur when running multiple applications simultaneously. Despite the back cover being able to pop off, the 2000 mAh Li-Ion battery of the smartphone is non-removeable. In terms of battery life, our device managed to last a full working day despite being on Wi-Fi all day at work and on a 4G network at home. 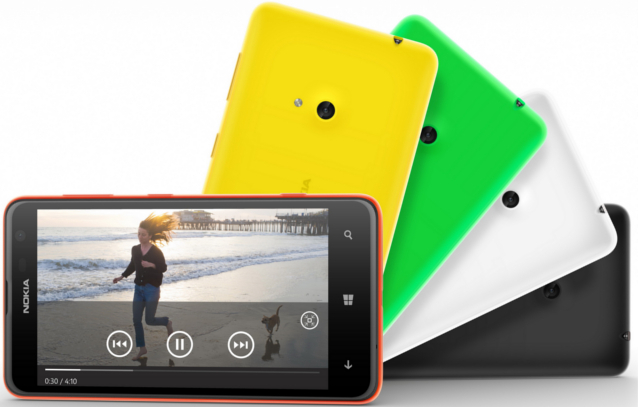 The Lumia 625 offers solid contruction and the largest display available on any Lumia smartphone at 4.7". In terms of optics the Lumia 625 boasts a 5 MP autofocus rear-facing camera with LED flash and VGA front-facing snapper. The latter is only really suitable for video calls rather than capturing selfies thanks to its paltry 0.3 MP resolution. We were disappointed with the photo quality of the main camera since it took average looking shots in good lighting conditions, and poor ones in low light. Picture quality quickly gets grainy whilst colours fade sans the presence of a good amount of natural light. The camera performance of the 5 MP main shooter at the back of the Lumia 625 is not up to par with Nokia's usually high snapper standards. Also onboard is GPS with aGPS and GLONASS support, FM radio (yes, on a Windows Phone), Wi-Fi 802.11 n, Bluetooth 4.0 and 8 GB internal memory which is expandable via the memory card slot by up to 64 GB. You also get 7 GB worth of free SkyDrive cloud storage and the best on-the-go mobile office productivity software in Microsoft’s Office mobile hub. One of the biggest drawcards of the device has to be the fact that it offers LTE (4G) connectivity, which allows for snappier downloads of apps, YouTube videos and games amongst others. Nokia’s Lumia 625 offers a very decent features list for its recommended retail price of R3 500 that includes the largest screen you can buy on a Lumia smartphone and snappier downloads via LTE. If it was available when we did our Top 5 midrange smartphones list last month, this smartphone would have had enough spec bullets to challenge our top 3 for midrange supremacy. The Lumia 625 is an excellent smartphone choice for midrange buyers craving an alternate platform to Android, and Nokia- as well as Windows Phone fans. LTE connectivity; good dollop of feature bang for a midrange pricetag; biggest screen of any Lumia smartphone; expandable storage; and FM Radio. Low display pixel density; outer shell not easily removable; prone to noticeable lag whilst multitasking; and camera performance not on par with other Lumia devices.